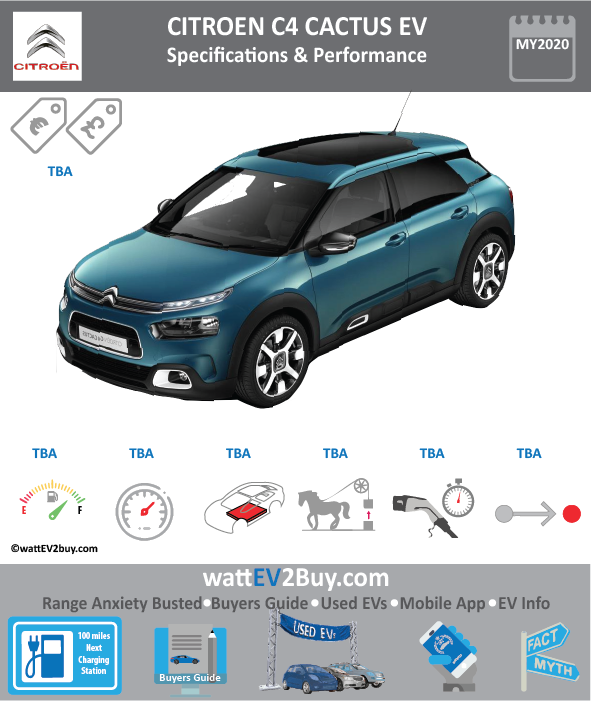 wattev2buy explores the Citroen C4 Cactus EV specs, battery, range, performance pictures as it vies for a position in the growing EV market. Citroen will release a pure electric version of the C4 Cactus in 2020. The C4 EV is developed on the PSA Group CMP modular platform and will be the French automakers second pure electric EV following the C-Zero. Interested in buying the CITROEN C4 CACTUS EV? See how the price and range of the CITROEN C4 CACTUS EV compare with its competitors in key markets. Go to our detailed breakdown of Global EV Sales to see how the CITROEN C4 CACTUS electric car fares to its competitors in the fast-growing EV market. Currently there are no Top 5 EV news related to the CITROEN C4 CACTUS EV.